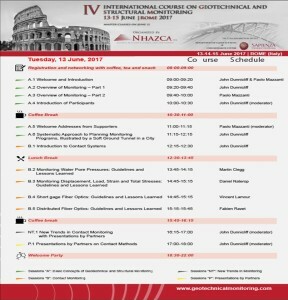 The 4th International Course on Geotechnical and Structural Monitoring, organized again by Paolo Mazzanti and directed by John Dunnicliff, will follow the same general format of past successful editions. However, some relevant innovations will characterize this edition, such as the venue and a significantly renewed panel of speakers. Furthermore, the most challenging Case Histories will be selected by those submitted by course participants and will be part of the course schedule. However, the most relevant news will be the Master Classes, led by international experts the day before the official beginning of the Course, specifically oriented to provide practical basic know-how on use of the most common monitoring systems. Take a look at the Official Schedule of 2017 Edition. As in the past editions, several companies are expected to attend the 2017 edition of the course to show their innovative solutions equipment for geotechnical and structural monitoring. This is a course for practitioners, taught by practitioners with wide field experience. The emphasis is on why and how to monitor field performance. The course is structured in 3-days course (13-15 June, 2017), 1-day Master Classes (12 June, 2017) and a half day Field trip (16 June, 2017).